The Oceans Apart exhibition at MMU Special Collections Library was curated by Dr John Gibbons from his personal collection of items and manuscripts relating to transatlantic crossings between 1870 and 1940. John kindly met with me last week to talk me through his exhibition and how his collection came about. Gibbons’ collection originated from documents from his grandfather’s family business as an emigration agent, within Westport, County Mayo in Ireland. His grandfather, also named John Gibbons, helped local people emigrate to the USA and Canada, undertaking paperwork, making applications and booking crossings. They would make the journey from Westport, for example to Liverpool, then Liverpool via ocean liner to New York. 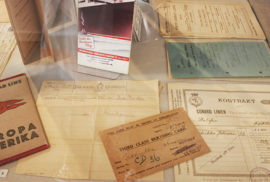 Much of the exhibition is formed from his inherited collection of ledgers, letters, books from the family business and promotional material for the White Star Line shipping company. Numerous emigration agents across Ireland had important social roles to play as they wrote letters supporting applications for emigration, explaining personal and family circumstances. 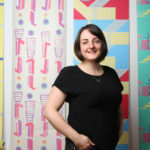 The majority of Irish emigrants were women. In the case of those going to Canada, there were restrictions on women travelling alone and they needed to be sponsored by a family member. In response to this mass exodus of young, abled persons leaving Ireland for a more prosperous life, there was some anti-emigration sentiment. Often discussed in newspapers, anti-emigration societies campaigned against constant departures to the Americas in fear of a reduced population and anxieties about the future of Ireland’s prosperity. Gibbons has continued to accumulate items relating to transatlantic crossings via ocean liners, and his collection purchased mainly via auction over the years is extensive and fascinating. 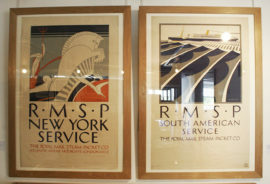 The exhibition Oceans Apart displays a wide range of shipping posters and promotional material from dominant shipping companies such as Cunard and White Star Line. Until 1924 when emigration laws were tightened considerably in the United States, the dominant customers of transatlantic crossings were the emigrant, apart from First Class travel. After this threshold, the shipping companies needed to rebrand transatlantic routes, and higher-end clientele were marketed to heavily in the 1930s for travel and tourism. 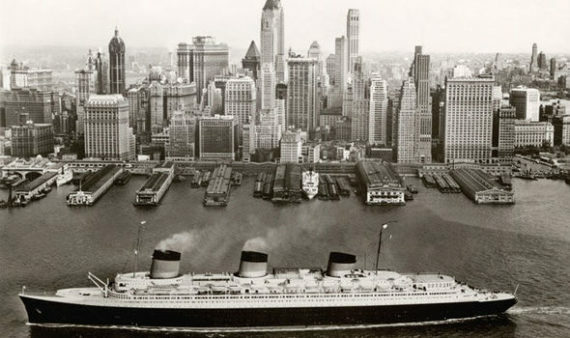 During the 1930s, there was a new brand of ocean liner with modern design which represented national cultural innovation. Liners such as the Queen Mary, 1934, and the French Lines liner, Normandie, 1935, led the way with modern design and interiors. During and after this period, shipping companies also appealed to former European emigrants to North America with transatlantic journeys to ‘Return to The Old Country’ as a tourist. After World War II, transatlantic travel became more accessible by air and emigration lessened. In the present day, transatlantic crossings are offered to the high-end markets by Cunard, and Cruise lines are very popular across many parts of the globe. Oceans ApartOceans Apart highlights the routes taken by masses of emigrants across the Atlantic Ocean, as well as suggesting how their lives developed in North America, and the poor living circumstances which catapulted them to move abroad. John gave me a copy of his speech at the Private View on the 3rd May, which I sadly missed. Within the speech, he contextualises this period of transatlantic crossings from Europe to America, to later emigrations such as the ‘Windrush’ generation and the subsequent poor treatment of these individuals who came from Commonwealth countries to fill post-war labour shortages. He also references a recent report from the United Nations on International Migration (2017) which identified that 283 million live in a country other than where they were born. In a quote by John Berger, he alludes to our assumption that the migrant is sometimes ‘the other’, ‘to consider his life- its material circumstances and inner feelings – is to be brought face to face with the fundamental nature of our present societies and their histories. The migrant is not on the margin of modern experience- (but).. absolutely central to it’..